I had to report back to Earth after destroying the robot, so another quick jump and I'm back in Sol system. The promise of another good trade coaxed me toward Venus first, but the rock trail led me over to Dream instead. Uhh, how did they get in there? Maybe they misheard me order the new laser I picked up from The Golden Calf? On Dream there was an AWESOME new ship. 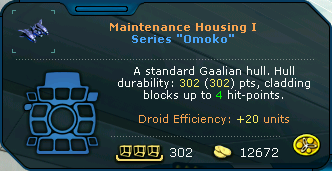 It was a special order from the Minnaver Space Docks, complete with droid tunnels for increased droid repair. 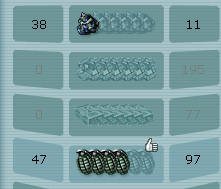 Don't quite have enough, but it looks like an excellent buy! Nothing else was worth buying on my way to Venus, so I left the hold empty for more rock collecting. There seems to be quite a bit just floating around the solar system. Why isn't anyone else hoovering it up? At Venus I may have found the answer. My gripper was almost broken from overuse and took 100cr to fix! Still, that's only ~10 tonne of rock. I must have shunted close to 150 tonne by now. 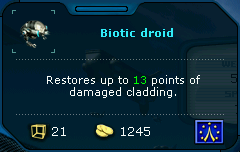 The Venetian traders also had a repair droid for sale that I had my eye on last time through. It's an early model, but it's been enhanced from the normal 5 units of repair to 13 units. The trader had indicated that they help fix minor damage from, say, running into asteroids, and can also be a godsend in a dogfight extending your lifespan. Well, technically the hull's lifespan, but once the hull goes, you go. So I think the important thing here is ensuring I don't .. err .. go. Most of my equipment (including the shiny new droid) had to be left behind on Venus to make way for ~230 tonnes of medicine destined for Earth. Prices for Equipment had reversed too, so I made a double trip to keep the trader in me happy. There was a slimline gripper on sale too. It was pretty busted up, but worth the 1200 credits to complete the set of lightweight components to go with the new hull. Now I'm flat broke, but grinning from ear to ear!